We need to recognize that leadership in our world must expand beyond formal titles. We work in a field where leadership is necessary 24 hours a day, not just the hours the offices are open. Until we start to live and breathe this, our organizations will not grow and change. We’ve been hearing a lot lately about how our field is difficult to live and survive in. We blame a lot of the stress on the regulatory world we live in. However, a lot of the regulatory stress would be alleviated if we spent more time focusing on leadership and less time focusing on the “what ifs” in our field. We spend more time planning for the worst rather than focusing on the potential positive “what ifs.” We have become victims of our own doing. Sure, things happen to us every day. People call off. Deficiencies are found. There are falls. Residents complain. Families complain louder. All that said, we know these things will happen. How we react and respond defines our culture. We can either stay ahead of it or let it control us. Unfortunately, too many in our field let these challenges define our culture. We need to accept these challenges and lead, in spite of them. In the moment that is hard, terribly hard. Paralyzingly hard. We react. We react emotionally, we blame and we become victims. It’s time for all of us to stop acting like victims and start acting like leaders. Please remember I’m in the thick of it, just like you. I hear all the excuses most days. There are times I feel as if talking people off the cliff is all that I’ve accomplished for the day. Until we have a committed group of leaders who are brave enough to stand at the cliff’s edge and feel comfortable with the level of risk and scrutiny we live under, nothing will change. I wrote today’s blog in a hurry, based partly on recent conversations. I don’t feel like I have the time to articulate exactly what needs to be said because there are fires that should be put out and conversations that need to be had. The work seems never ending and nearly impossible to solve. I do know, however, that it starts and stops with leadership. It starts and stops with our willingness to spend the time with everyone to talk, lead and believe in leadership. The housekeeper who involves herself because it’s the right thing to do is a leader. The activity assistant who speaks up until someone listens is a leader. The maintenance person who spends time talking with a resident about the good old days is a leader. The certified nursing assistant who comforts a family discouraged by their loved one’s condition is a leader. The cross-trained activity assistant who picks up a night shift because a confused resident is struggling is a leader. A teammate who calls out another teammate for not holding their own is a leader. Leadership has nothing to do with initials or tiles but has everything to do with character. We have to invest in everyone. I recently spoke to a high school leadership class. At first, I think the students didn’t understand why a CEO from a retirement community would be speaking to them about leadership. By the end of the discussion, they understood. Julie Thorson’s “Living Leadership” blog was named the 2016 “Best New Department” Bronze Award winner by the American Society of Health Publication Editors. The president and CEO of Friendship Haven, a life plan community in Fort Dodge, IA, Thorson is a coach’s daughter at heart. She is a former part-time nursing home social worker who quickly ascended the leadership ranks. Now a licensed nursing home administrator, she has been a participant in LeadingAge’s Leadership Academy and LeadingAge Iowa’s Mentor of the Year. 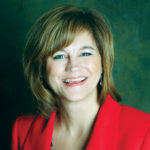 She is currently a mentor in LeadingAge Iowa’s Emerge leadership program.